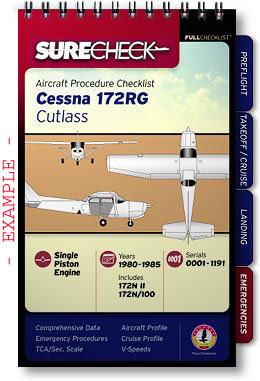 The checklists are in SureCheck’s multi-page "Full" Version checklists and are divided into tabbed sections for ease of use. Information is detailed and concise and covers everything from basic operations to tips & tricks. Our exclusive Durasyn™ printing system means tear-proof, waterproof, non-glare pages and years of use! Durasyn™ is our exclusive superior synthetic system. Instead of using paper, or even a hard plastic laminated "card", this polymer material is completely weatherproof, tearproof, non-glare, and withstands years of use. So it's strong, durable, and easier to read. And only SureCheck has it. Edge-tab layout is as easy to use as single-page versions, but with the benefit of having more comprehensive , detailed data. Tabs also include helpful information such as temperature, weight, crosswind and distance conversion tables.